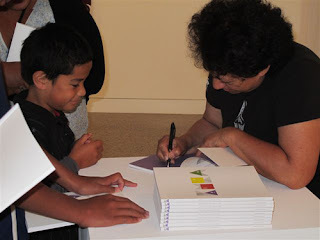 Kura: Story of a Māori Woman Artist was launched 21 January 2012 at Mangere Arts Centre — Ngā Tohu o Uenuku. The book takes its title from the exhibition currently on display at the Centre, which was curated by Nigel Borel and opened 16 December last year. 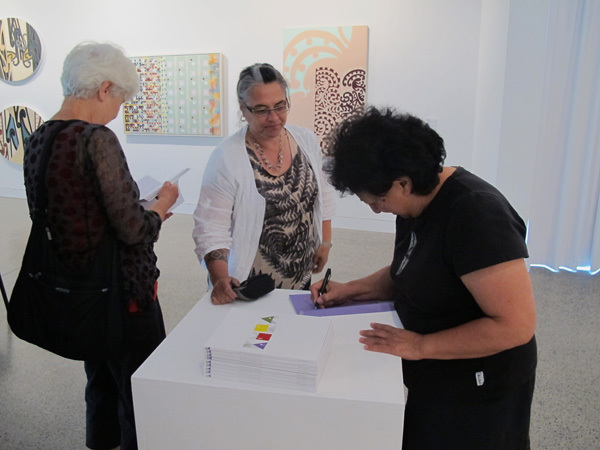 Conceived as a retrospective exhibition of a senior Māori woman artist, it offers an experience of quality ideas and achieves all it set out to celebrate. The exhibition highlights the art practice of Kura Te Waru Rewiri, a founding member of the 1970s protest group Nga Tamatoa, a fine arts educator and contemporary arts advocate, and contemporary painter. 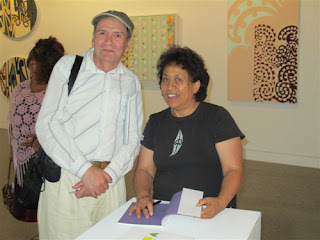 The book launch attracted whānau, friends and artists. 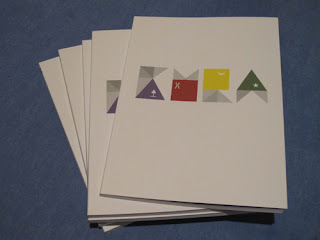 Tributes were made to Kura for her contributions to contemporary art and attendees were invited to take away signed copies of the publication. It is a handsome 80-page book, an example of Kura’s connoisseurship as a painter and the development of her contemporary art journey. The essays in the book form strong relationships with contemporary Māori art and the Mana Wahine art movement. 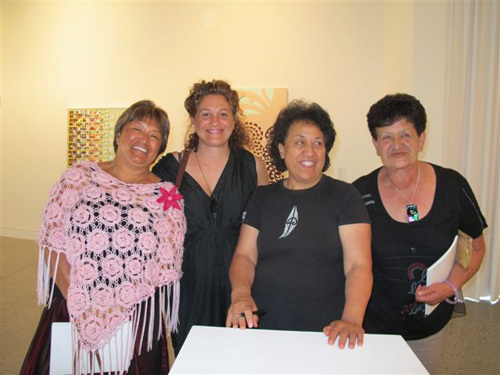 Kura shares this legacy with painters Emily Karaka and Robyn Kahukiwa, and a range of strong women leaders who worked for Māori visibility while analysing the Treaty of Waitangi (ToW). You could say that art then was a perfect vehicle to bring Māori and the ToW to the public’s attention. Those wahine toa who were inspirational at the time were Hana Te Hemara-Jackson, Donna Awatere, Eva Rickard, Dame Te Atairangikahu and Dame Whina Cooper. Kura publishes new writing by Nigel Borell, Megan Tamati-Quennell, Deidre Brown and myself. It brings forward the artist’s ideas and shows their relevance in today’s arts environment. The essays provide a context for the array of kaupapa Māori that Kura has explored over time, including the ToW. In this way, the exhibition and book can be thought of as history lessons you might now have learned. We hear that Kura’s double conundrum of being a woman/Māori artist belongs to the 20th century because this is no longer politicised – even though her present-day content is just as challenging as her painting practice of the 1980s and 90s. 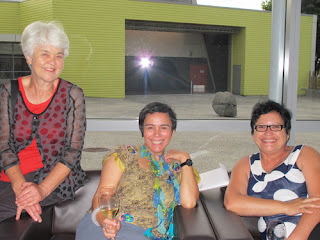 Her 2000s’ exploration of kōwhaiwhai patterns, for example, challenge some Māori male practitioners and kōwhaiwhai is not well understood by contemporary practitioners and critics. Perhaps part of this problem is that today’s detractors still think kōwhaiwhai is what Gordon Walter and Theo Schoon painted. Yet, as is shown, by the end of the first decade of the 2000s Kura took control and brought forth new understandings, theories and a new appreciation for Māori art forms, patterns and meaning. The book also presents information and facts not previously published about the artist. Kura changed her name by deed-poll when she was 21 years as an act of liberation. You can see this freedom in the 1971 photograph of her and Tame Iti, taken during her University of Canterbury days. She told me that she loved to go op-shop rummaging on the lookout for fur coats and Christchurch certainly had a startling array of them for a young Māori woman from the North to purchase for $1 – which was a lot of money in those days. Kura’s personal and professional relationships are enduring and she maintains friendships with people from all cultures and walks of life. Her influence is felt in the practitioner community in her support, guidance and mentorship of artists and contemporary Māori art curators such as Nigel Borell. James Pinker, visual arts manager of Mangere Arts Centre has this to say about the launch. Last words go to Nigel Borell, ‘We are all very proud and pleased with the results and look forward to finally sharing the publication with the public.’ Copies can be purchased from The Mangere Arts Centre at a very reasonable $20 each.